Founded in 1917, Grand Central Market is a legendary food hall in Downtown Los Angeles that brings together the many traditions and flavors of the city. Now, GCM’s first cookbook puts the spotlight on unique recipes from its diverse vendors, bringing their authentic tastes to your home kitchen. From Horse Thief BBQ’s Nashville-Style Hot Fried Chicken Sando to Madcapra’s Sumac Beet Soda to Golden Road’s Crunchy Avocado Tacos, here are over 85 distinctive recipes, plus spectacular photography that shows off the food, the people, and the daily bustle and buzz. Stories about the Market’s vibrant history and interviews with its prominent customers and vendors dot the pages as well. 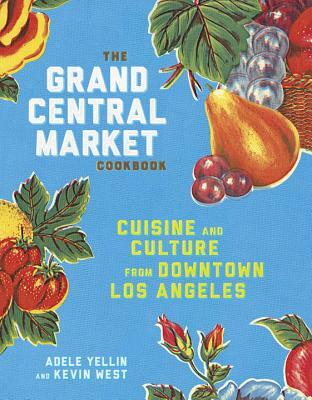 Whether you’ve visited and want to make your favorite dishes at home, or are simply looking for a cookbook that provides a plethora of multi-national cuisine, The Grand Central Market Cookbook is sure to make your kitchen just a little bit cooler. 2018 IACP Cookbook Award nominee for Compilations. ADELE YELLIN is president of the Yellin Company, a Los Angeles real estate management and development firm that own and operates Grand Central Market. Adele has two children with her late husband, Ira Yellin, and two grandchildren. KEVIN WEST served as a creative director during Grand Central Market’s revitalization from 2012-2016. His previous books include Saving the Season: A Cook’s Guide to Home Canning, Pickling and Preserving and Truffle Boy with Ian Purkayastha.